FRENCH: Medicinier, Pignon d inde, Plante bouteille. INDONESIAN: Jarak bali, Jarak batang gajah. MALAY: Jatrofa buncit, Jarak buncit, Jarak gajah. MYANMAR: Da bin shwe-htee, Ta-bin-shwe-hti. SPANISH: Tinaja, Pansona, Tartogo, Ruibarbo. VIETNAMESE: Dau lai la sen, Ngo dong canh, Sen luc binh, Dau lai co cu. - Jatropha podagrica derives from the Greek 'iatros' meaning healer and trophe, food. Podagrica derives from podagra meaning 'foot gout,' especially of the big toe, or podagrikos, liable to gout. - Buddha bellly name alludes to its thick and swollen trunk. Buddha belly is a tropical, succulent or sub-woody shrub, growing to a height of 0.5 to 1 meter. Stem is swollen, knobby, gray-skinned, with a large bottle-like caudex. Petioles are 8 to 10 centimeters. Leaves are peltate, glossy green adaxially, gray-green abaxially, margins entire, wavy, or shallowly 3- to 5-lobed, 6 to 8 palmate veins, up to 12 inches in diameter, with a stout stalk attached on the underside of the leaf. Flowers are small, bright red or orange-red, and coral-like clusters at the tip of a long red stalk. Fruits are capsules, ellipsoidal, about 1.5 centimeters , with 3 longitudinal grooves, initially green and fleshy, maturing to dark brown and explosively dehiscent to yield 2 to 3 black seeds, scattering them 3 to 4 meters away. Seeds are smooth and glossy brown, about 1.5 to 2 centimeters long. - Cultivated for ornamental purposes. - Native of tropical America. - Contains a purgative oil and a phytotoxin or toxalbumin (curcin) similar to ricin in Ricinis. - Latex yields an alkaloid, jatrophine. - In a phytochemical study, screening for secondary metabolites yielded alkaloids, tannins, flavonoids, saponins, and phenols in the leaves, roots, seed and stems. Percentage of tannins was 6.79% (leaves), saponin 3.15% in leaf and 2.44% in seed. Alkaloids in leaf was 0.33%, stem 0.15%, seed 0.18%, and root 0.26%. - Toxicity: All plant parts are poisonous, especially the seeds. - Roots considered antibacterial, antifungal, aphrodisiac. - All plant parts are considered toxic, but in particular the seeds. In children, as few as 1 to 3 seeds can cause symptoms. - Main toxins are the purgative oil, phytotoxin, or toxalbumin (curcin), similar to ricin in Ricinis. - Symptoms occur about half an hour after ingestion of seeds, with acute abdominal pain and burning sensation in the throat, followed by nausea, vomiting, and diarrhea, sometimes with blood in the vomitus and feces. There may be CNS depression. - Main risks are dehydration and cardiovascular collapse as a result of hemorrhagic gastroenteritis. - Children are more susceptible. - In some instances as few as three seeds produce toxic symptoms. In others, consumption of as many as 50 seeds results in only mild symptoms. It has been suggested there may be variants without seed toxicity. - In the Quezon province, where some refer to it as "ginseng," roots are pounded and steeped in lambanog for its imagined male tonic, aphrodisiac, and erectile-assistive (viagra) effect. - In China, plant used for pain relief, reduction of swelling, and detoxifying snake bites. - Roots used for treating infections. - Used to treat jaundice, gonorrhea. - In Brazil, used to expel intestinal worms. - Biofuel: Seed oil potential source of biofuel. - Ritual: Plant used by voodoo practitioners to drive away evil spirits. - Tanning: In Mexico, use for tanning leather and producing red dye. 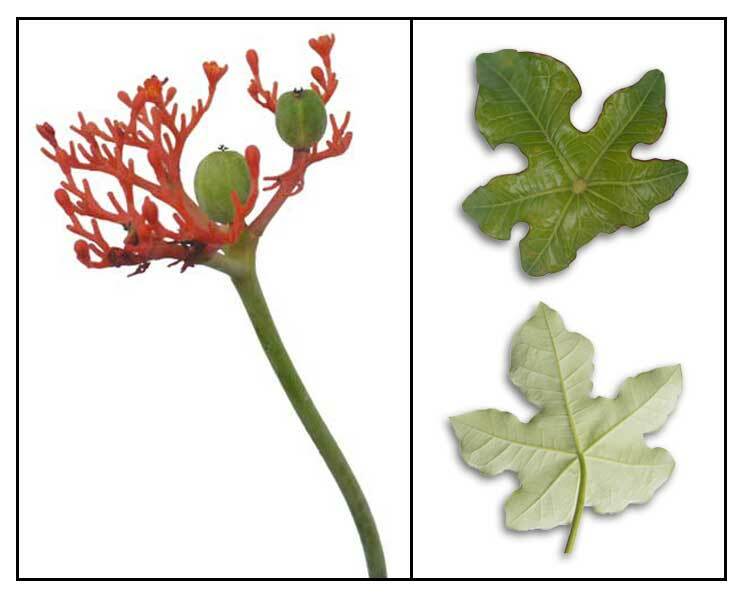 Evaluation of antimicrobial activity of medicinal plant Jatropha podagrica (Hook) / BHUSHAN BHASKARWAR, PRAKASH ITANKAR and ABHAY FULKE / Roumanian Biotechnological Letters, 2008; Vol 13, No 5: pp 3873-3877.